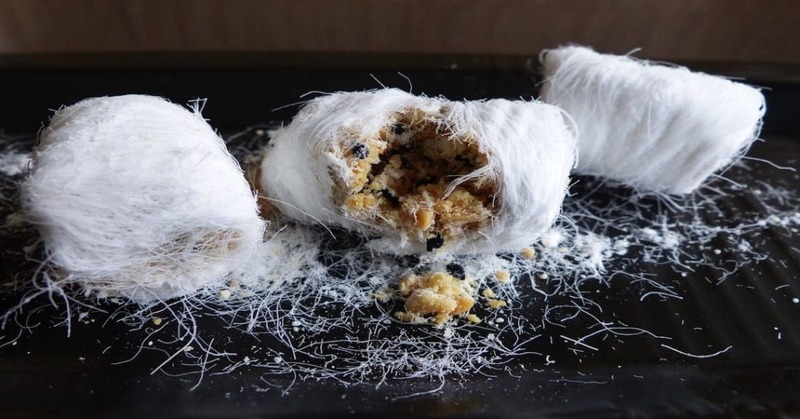 You only need a few ingredients—corn syrup, cornflour, and a nutty filling—to make dragon beard candy. The corn syrup is simmered and then cooled to make a chewy, firm lump. The lump is then formed into a ring like a doughnut, which is stretched and twisted repeatedly. Every stretching and twisting doubles the number of strands created, until there are thousands of them. It is similar to the process of making hand pulled noodles. You don’t need to be good at math to know that it takes lots of stretching and twisting. And one needs to be skilled enough to make sure the individual strands are perfectly even and as fine as hair. Once enough fine strands are formed, they are wound into a cocoon and twisted around a sweet, nutty mixture which is normally composed of crushed peanuts, coconut shreds, and/or sesame seeds. Fresh dragon beard candy has a very short shelf life. When exposed to moisture or high temperatures, the delicate strands will melt and the candy is reduced to a messy puddle. No matter how much you want to share this delicacy with your friends and families back home, you should refrain from getting this candy as a souvenir. Dragon beard candy is the most delicious immediately after being made anyways. You’ll feel the fine strands quickly melt on your tongue and surprise your taste buds with the delicately sweet, nutty filling. The only tool you need to eat this candy is your hand. As the candy is so delicate, you will break it into thousand pieces with a fork and will find it very challenging to get a good grip of it with a pair of chopsticks. Be sure you hold the candy gently with your fingers. If you have warm hands, you may want to minimise the time you hold the candy or the threads will start to melt. The cleanest way to eat this candy is to pop the whole thing in your mouth. But it may not be a pretty scene as the candy is not that small. The common way is to savour the candy in two bites. But make sure you have a tissue handy because the fine, sugary threads tend to stick to your face, chin, fingers, and clothes. 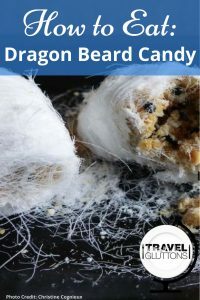 For those sporting a beard or moustache, you may need to accept the fact that the dragon beard candy will get onto/into your whiskers. The dragon was the symbol for Chinese emperors. It is believed that the candy is called dragon beard candy because the delicate strands stuck on the Emperor’s face and beard when he was enjoying it thousands of years ago. If you can’t find any fresh dragon beard candy where you are, check out this video to feast your eyes on the process of making dragon beard candy. 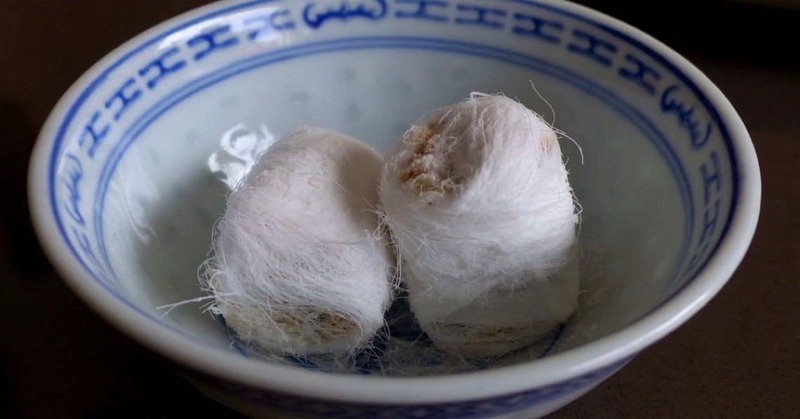 Have you managed to eat dragon beard candy without getting it all over you? Learn how to eat even more of the best food from around the world right here.